Facebook just built a gigantic solar-powered drone that will stay in the stratosphere for months at a time, beaming broadband Internet to rural and hard-to-reach areas. 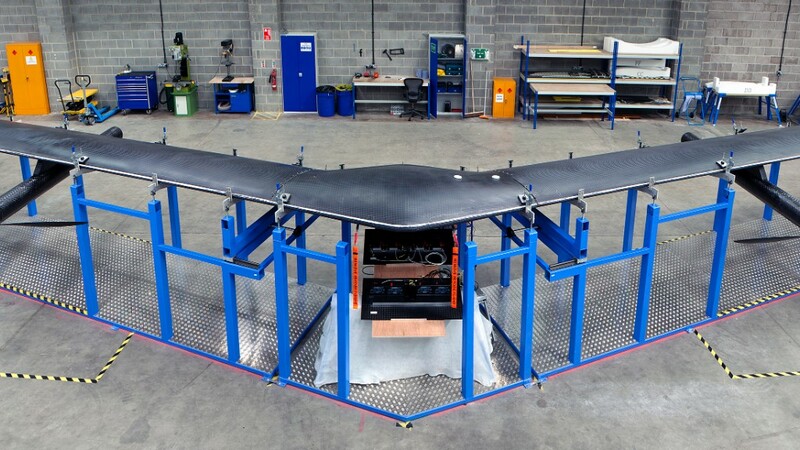 The drone, called Aquila, is the baby of Facebook's (FB) year-old Connectivity Lab. The lab has been developing new technology as part of the social network's mission to "connect everybody in the world." Four billion people don't have access to the Internet, and 10% of the world's population lacks the necessary infrastructure to get online. To reach these people, Facebook is working on drones, satellites, lasers and terrestrial Internet technology. On Thursday, Facebook announced it had finished construction on its first full-sized drone and announced other project milestones. The team's researchers say they've found a way to use lasers to deliver data speeds from the drones ten times faster than the industry standard. Facebook has been working on the Aquila for a year, building off of technology it acquired when it bought UK drone company Ascenta in 2014. The solar-powered unmanned aircraft is designed to fly far above commercial airspace and weather, and to stay in the air for three months at a time. It could give Internet access to people located in a 50-mile radius on the ground. "It's sort of like a backbone of Internet using lasers in the sky, that's the dream we have," said Yael Maguire, the engineering director of Facebook's Connectivity Lab. Aquila hasn't taken flight yet, but the UK-based team has done flight testing on a number of scale models. Over the next six months, the group will run structural and other tests and eventually take it for its first test flight. The technology is years away from being used in the field -- Facebook doesn't yet have an exact timeline. The Aquila drone looks like a giant v-shaped boomerang. It's 140-feet in diameter -- about the same wingspan as a Boeing 737 -- and covered in solar cells. It is made of light carbon fiber that is two to three times stronger than steel when cured. It will weigh around 880 pounds when fully outfitted with motors, batteries and communications equipment. It won't require a runway. The Aquila will be launched by tethering it to a helium balloon and floating it straight past the weather and commercial airspace. During the day, it will cruise in circles at 90,000 feet, soaking up solar power. At night, it will save energy by drifting down to 60,000 feet. Though current regulations require one pilot on the ground for each drone, Facebook hopes to design the Aquila so it can fly without a dedicated pilot. To get the Internet, a laser system will connect the ground and the drone. A Facebook team has been working on the laser technology in California, and says it has achieved speeds of tens of gigabytes per second -- that's fast enough to allow hundreds of thousands of people to access broadband Internet simultaneously. The lab works with Facebook's Internet.org, which has been criticized for only giving people access to a limited number of Internet services. But Aquila is designed to provide full broadband Internet. Facebook also won't operate the planes itself. Instead, the company plans to work with local providers or governments to actually deploy the technology, though details are still unknown. "Building big planes and selling them is not core to our mission of connecting people," said Jay Parikh, a VP of engineering. "We are not going to take this stuff and be 'Facebook ISP.'"